I was reading an article by Dunn et al (2018) recently about the public attitude towards pest management. Although this article was using the Grey Squirrel in the UK as the example, the same issues are relevant in Australia. The death of any animal is a sad affair. For pest species such as cane toads, feral cats and foxes where the damage they do to native fauna is well known and understood, the public generally accept that these animals should be euthanased. For species such as the cane toad there has been a public discussion about methods of euthanasia (see RSPCA 2017; The New Daily 2015). The WA Animal Welfare Act (2002) doesn’t distinguish between groups or type of animals, so all animals must be treated the same, i.e. ‘a person must not be cruel to an animal’ (section 19(1)). However, for other species such as Rainbow Lorikeets, Short Billed Corellas, wild horses, feral camels and wild dogs some people take a different point of view. Similarly, when a native species has become over abundant in a particular location, most often because of human intervention (e.g. Australian White Ibis, Western Grey Kangaroos), but also because of droughts and other natural phenomena, then a control program is often required, and considered a humane way of dealing with the problem. Culls must be undertaken in a humane manner. The Animal Welfare Act (2002) indicates it is an offence to cause unnecessary harm to an animal, so one presumes that culls are undertaken when there is no other reasonable option, or the alternative is likely to cause more harm in the short or long-term. Animal welfare groups, animal carers and the like often become concerned about culls and relocations and involve the media (ABC News 2015; Herald Sun 2015). Reasoned discussion or argument is often difficult in this environment when people have strong feeling and emotions. In this context, it was interesting to read a recent article by Braysher and Arman (2014), where they successfully euthanased wild horses that had entered the Namadgi National Park in the ACT that had come from the adjoining Kosciuszko National Park. The implemented management plan involved consultation with stakeholders including the RSPCA, adjoining landholders and the ACT Animal Welfare Advisory Committee. The Management Plan was endorsed by the relevant Minister. Horses were enticed into yards (using salt and molasses) where they were trapped and subsequently euthanased. In this case trapping and euthanasia was done in accordance with a relevant Code of Practice (COP) and Standard Operating Procedure (SOP). This program was deemed a success. In many circumstances, it is not reasonable nor is feasible for the Environment Minister to become involved nor are there approved COPs or SOPs for the capture and euthanasia of many of the feral or nuisance species in Western Australia, although Pestsmart does provide a wealth of information on managing pest animals. 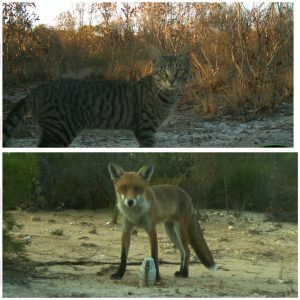 In Western Australia we have a Cat Act (2011) and Cat Regulations (2012), but neither the Act nor the Regulations indicate how to deal with feral cats, particularly those outside of built up areas. The Act indicates that an ‘authorised’ person may seize any cat that the authorised person believes, or suspects, on reasonable grounds is the subject of an offence against this Act, but the authorised person is to ensure the seized cat is taken to its owner or impounded in a cat management facility. It seems as if this Act and Regulations focus on domestic and stray cats in urban areas, and not feral cats that are killing wildlife outside the built up area. Government agencies and others use 1080 (sodium monofluoroacetate) in the management of non-native, and mostly feral pest species (e.g. foxes, cats, pigs and wild dogs). 1080 is a metabolic poison that is extremely toxic to air-breathing organisms that do not have immunity. Sodium monofluoroacetate occurs naturally in about 40 native plant species in Australia, primarily of the genera, Gastralobium, which grow in Western Australia. 1080 blocks the body’s muscle and organs ability to absorb energy from its food and they die from respiratory or heart failure. The death is not a nice thing to observe. Pindone is an anticoagulant that is used in rabbit control. Again the death is likely to be unpleasant. Are these poisons a humane way of dying? Images of shot foxes, cats, wild dogs and kangaroos are distasteful to some people, but a well placed shot is likely to be a very quick and humane method of ending an animal’s life. The Threatened Species Commissioner has developed a Threatened Species Strategy with a primary focus on reducing the number of feral cats. It is proposed that 2 million cats will be culled over a period of five years. To date, probably the most humane way in which we can euthanase feral cats is by shooting them, but it is an impossible task to shoot 2 million cats in five years. Journalists’ are always looking for a good story, and for some, if they can construct conflict and this will play out in the media, then facts and rationale behind what is being done is lost or ignored. See for example – WA Today 2016 with the opening sentence ‘A war is brewing between animal activists and golfers over a massive population of kangaroos …’. The media almost certainly elevated peoples’ emotions and rational sensible discussion was difficult. It is accepted that many of us feel uncomfortable about talking about these issues, given there is no easy and readily available solution. Braysher, M. L., and O. Arman. 2014. Managing Feral Horses in Namadgi National Park, Australia: A Sensitive Operation in 26th Vertebrate Prest Conference. University of California Davis. Ain’t that the truth Scott! It is indeed difficult to have a sensible discussion on these issues when peoples emotions run high! But as environmental scientists I feel we have a duty to educate and hopefully reduce the hysteria around this sensitive topic.